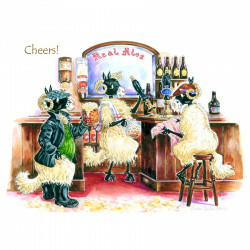 This place mat features sheep sharing a toast in an Irish pub, a Linda Birkinshaw design. This place mat features sheep sharing a toast in an Irish pub, a Linda Birkinshaw design. This place mat will protect your table and add a lively and original note to your decoration ! Dimensions: 29.2 x 21.6 cm. Heat-resistant up to 140°C. The reputation of the Claughton’s small family business continues to develop thanks to their fun, original and colourful product collections.